A couple of frontal passages today and in the coming days have allowed our forecast to have a little bit more variability than a typical summertime pattern. Overall, while temperatures look to stay in the 90s throughout the foreseeable future, we will have periods of both slightly above and slightly below average temperatures, and also reduced humidity, which should really lift our spirits! 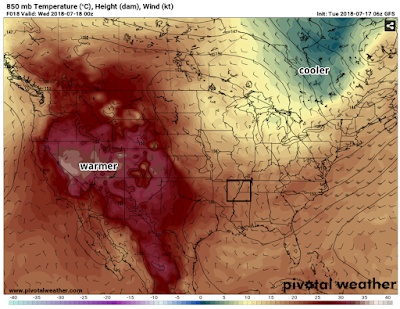 Even if you look at the next couple weeks, you can see this small roller coaster type feature of some above average temps and some below average temps. It will be nice to have this variability in the coming weeks. We're still highlighting above average warmth today though as temperatures are expected to reach the mid 90s by this afternoon with dewpoints in the very muggy mid 70s. 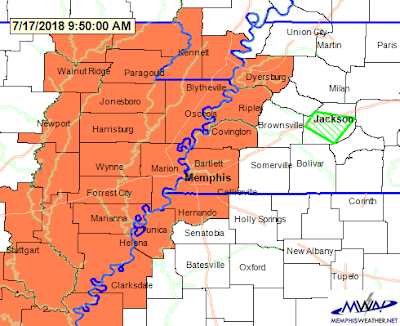 With temps and dewpoints so high, portions of the Mid-South are currently under a Heat Advisory as heat index values will top off between 105 and 110 this afternoon. 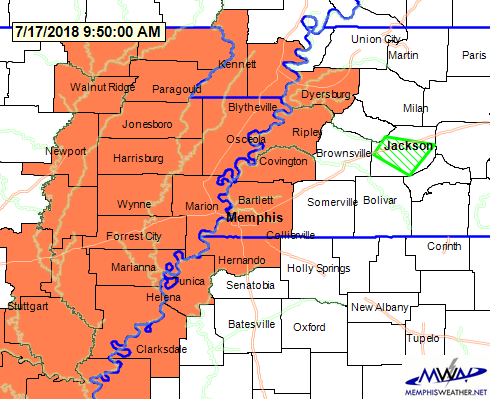 Counties highlighted in orange are under a Heat Advisory until 8 PM this evening. The good news is that a "cold" front is expected to pass through the area today. While this won't knock down our temps a whole lot, we will feel some relief in the coming days, particularly a reduction in the dewpoint. I don't know about you , but I am really looking forward to the somewhat drier airmass! This front could initiate some shower and thunderstorm activity into this afternoon. Like most summertime thunderstorms, coverage will likely begin to decrease after sunset. Overnight temps will fall back into the mid 70s. Into tomorrow, we will begin to feel this somewhat cooler and drier weather pattern. An upper-level trough will continue to dig into our area over the next few days. What does this mean for us? Well, it will help to keep our winds out of the north, bringing cooler and drier air into the Mid-South. Looking at temperatures just above the surface across the U.S., the western half of the U.S. is experiencing some pretty warm temperatures. Luckily for us, our winds will stay out of the north, northeast over the next few days, ushering in the cooler and drier air. Overall, temps look to hang around near 90 over the next couple days with dewpoints backing off into the upper 60s. These lower dewpoints will keep the extreme mugginess away. However, with the upper levels of the atmosphere exhibiting northwest wind (what we call "northwest flow"), storm complexes moving out of the Plains could affect the Mid-South. This possibility means we'll keep shower and thunderstorm chances in the forecast Wednesday, and a lower chance Thursday. Good things can only last so long as warmer and muggy air attempts to make a comeback on Friday. 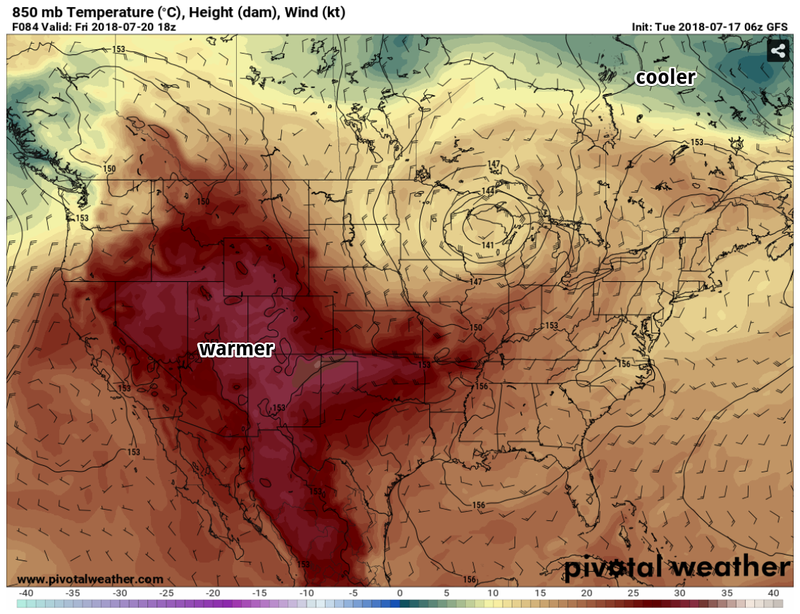 The predominately northerly winds discussed above will begin to shift to more westerly, allowing all those hot temperatures from the western U.S. to slowly migrate over to our area. Highs on Friday will reach back into the mid 90s with dewpoints creeping back into the humid 70s. As for rain chances, we will have to keep an eye on another front that poses to sweep through the Mid-South late Friday into Saturday. Depending the timing of this front, we could see some shower and thunderstorm activity later in the day. Our muggy and hot weather pattern will begin to move out following the frontal passage. 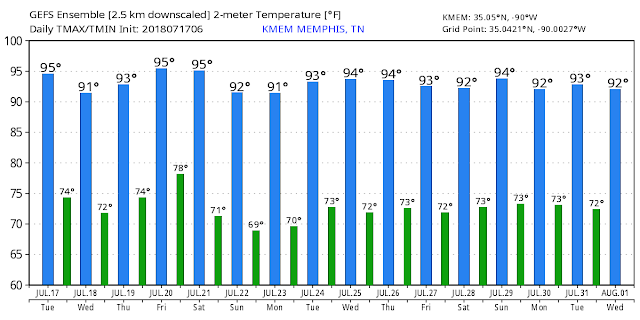 Temps look to stay in the mid 90s on Saturday before backing off into the low 90s on Sunday. 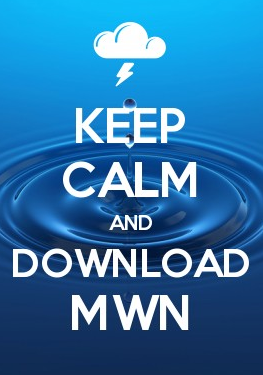 Luckily, rain chances will be minimal through the weekend. So if you have any outdoor weekend plans, it looks like you picked a fantastic weekend to have them!